Your Massachusetts (or New Hampshire) home is one of the single biggest investments you'll ever make in your lifetime, so be sure you do all you can to take care of it. A well-maintained home usually sells more readily and will usually bring a higher price when you go to sell your home. Regular maintenance also makes your home more comfortable and any regular care that you do put into it will minimize any unexpected repair work and expenses that could occur if your home was not maintained. Regularly scheduled small repairs and continuous upgrades to your home can and will keep any maintenance costs from becoming exorbitant. The maintenance schedule that I'm presenting here is a general guide for you to simply follow. The actual timing is left up to you to decide when you want to actually perform the tasks. You may want to further divide the list of maintenance items for each season into months so that your everyday schedule will not become affected by this list of tasks. Now let's get to work, so your home (and the components within your home) will last a lifetime. Clean or replace furnace air filters every other month during the heating season. Periodically check vents outside (intake and exhaust) to make sure they are not blocked by snow or debris. Then vacuum all heating supply registers, return grills, baseboards or radiators inside the home. After consulting your hot water tank owner's manual, carefully test the temperature and pressure relief valve to ensure it is not stuck. (Caution: This test may release hot water that can cause burns and it may also cause the valve to develop a slow leak due to sediment build-up not allowing the valve to close fully. This will require a plumber to replace the TPR valve). In some areas, sludge may accumulate in the bottom of the tank. Draining approximately 1 gallon of water from the clean-out spigot at the bottom of your tank will indicate the presence of sludge and the necessity for regular draining to control sediment and maintain efficiency. Be sure to shut off the power or fuel supply before draining any water from the tank. Clean the humidifier (if equipped), two or three times during the winter season. Vacuum bathroom fan grille or any other registers you may have in your home. I recommend removing the register grills and vacuuming inside the duct work, (as far as possible). Vacuum all fire and smoke detectors, as dust or spider webs can prevent them from functioning. Dust ceiling fan blades. Vacuum radiator grilles on back of refrigerators and freezers, and empty and clean the drip tray underneath the refrigerator. Check inside bathroom vanities and kitchen sink cabinets for signs of moisture. Look for leaks at shut-off valves at sinks, toilets, laundry equipment, and main water shut-off valve. Carefully inspect pipes for condensation or slow drips. Repair the plumbing system if necessary. Remove mineral deposits from faucet aerators and shower heads by soaking the parts in white vinegar and scrubbing them with an old toothbrush. Examine attic for frost accumulation. Check roof for ice dams or ice build-up. If either of these occur, this is a sign of inadequate insulation and/or ventilation. Check electrical cords, plugs and outlets for all indoor and outdoor seasonal lights to ensure fire safety: if worn, or plugs or cords feel warm to the touch, replace immediately. Check the operation of all ground-fault circuit interrupter outlets by pushing the "test" button. The "reset" button should pop out, indicating the receptacle is operating properly. Press in the reset button. Check the AFCI circuit breakers inside the main panel. Press the test button to make sure it trips. Then reset. Have all heating and cooling systems checked by a qualified service person once a year or according to the manufacturer's warranty and service recommendations. Failure to do manufacturer-recommended servicing may void warranties. FURNACE: Examine the forced air furnace fan belt for wear, looseness or noise; clean fan blades of any dirt buildup (after disconnecting the electricity to the motor). Then clean dirt and dust from around the air grills and ducts. Open furnace humidifier damper and clean humidifier (if equipped). 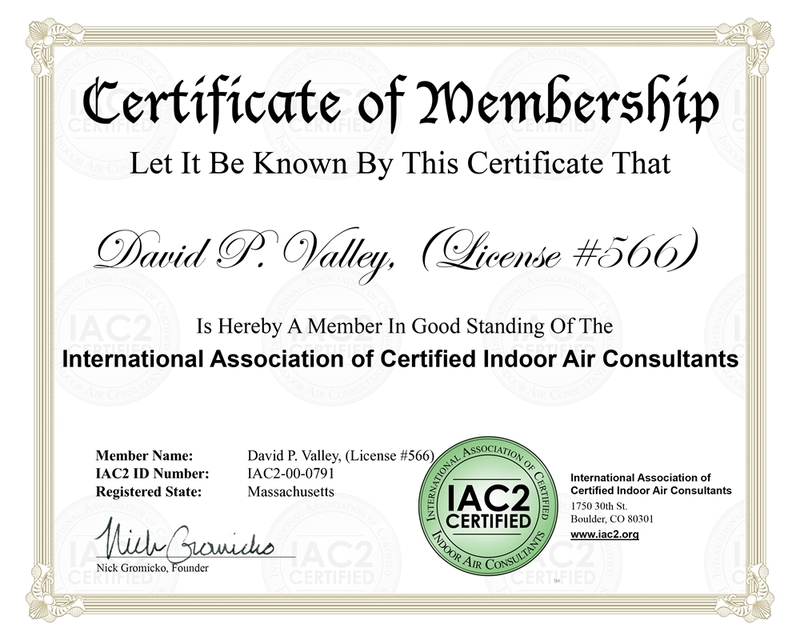 Hire a licensed HVAC technician to inspect the thermostat, electrical components and controls, inspect the heat exchanger, check flue, air flow and air fuel mixture, adjust the burner and oil the motor and circulating fan. The exhaust pipe should be checked for loose or corroded sections. Have your ducts cleaned at least every 5 to 6 years, this keeps your furnace clean and will increase the life expectancy. Make sure the exposed ductwork have no cracks or leaks and seal seams (where needed) with aluminum tape. BOILER: Bleed the air from hot water radiators. Older circulating pumps should be lubricated twice during the heating season. Expansion tanks should be drained annually. The heat shield (located where the burner enters the heat exchanger) should be checked to ensure that it is not loose or corroded. Burn marks around the heat shield or soot on the front may indicate a draft or combustion problem. A technician should be contacted. Paint interior rooms while it's still warm enough to leave windows open. Ditto for shampooing or replacing carpets. Check smooth functioning of all windows and lubricate as required. For single pane widows, remove or replace all screens with storm windows. Examine all hardware and locks on windows and doors, and lubricate moving parts. Each exterior door should have a one-inch deadbolt lock for safety. All yard care power equipment should be drained of fuel in the late fall or early winter and serviced according to manufacturer's instructions. Cover outdoor furniture or store it inside a shed. Clean and repair garden equipment after the last use of the season. Remove dirt and rust, then store in dry area. Upcoming winter will be a good time to file rough spots on hoes and shovels and to apply linseed oil to handles of garden tools. Thoroughly rinse pesticide and herbicide sprayers to prevent clogging, and rinse fertilizer spreaders to prevent corrosion. Drain and store outdoor hoses. Close the valve supplying the outdoor hose connection and drain the hose bib (exterior faucet), unless your house contains frost proof hose bibs. Ensure that all smoke detectors, carbon monoxide detectors and fire extinguishers are in good working order. Replace batteries in appropriate devices as needed, or at least twice each year. Massachusetts regulations require detectors to be installed on every habitable level of your home and within 10 feet of any bedroom. Check fire escape routes, door and window locks and hardware, and lighting around outside of your house; ensure that your family has good security habits. Again, Check the basement floor drain to ensure the trap contains water. Refill with water or oil if necessary. Take care of known issues with pipes that freeze. Heat tape/wire can be used to keep them warm during extremely cold weather or insulate to improve freezing conditions. Ensure that all doors to the outside shut tightly, and check other doors for ease of use. Renew door weatherstripping if required. If there is a door between your house and the garage, install or check the adjustment of the self-closing device to ensure it closes the door completely. Disconnect the duct connected to the dryer and vacuum lint from duct, the areas surrounding your clothes dryer and your dryers' vent hood outside. Ensure that all windows and skylights close tightly. Remove screens from the inside of casement windows to allow air from the heating system to keep condensation off window glass. Again, Clean leaves from eaves troughs (gutters) and roofs, and test downspouts to ensure proper drainage from the roof. Ensure that these downspouts carry all rain water away from the foundation area at least 5 feet. Downspout extensions will improve any basement seepage conditions. Check chimneys for obstructions such as nests. Have your wood burning fireplaces and appliances inspected annually and cleaned/swept and repaired as required to prevent chimney fires and carbon monoxide poisoning. Celebrate spring by cleaning the garage. Hold a yard sale, or organize a community yard sale with neighbors. Dispose of paint thinners, household cleaners and pesticides properly. Contact your city's department of public works to find out when the next scheduled collection of hazardous materials is. Check and clean or replace furnace air filter. Shut down and clean furnace humidifier (if applicable), and close the furnace humidifier damper, as this will not be needed until next heating season. Have central air-conditioning unit checked according to the recommendations of the unit's manufacturer or every two or three years. Replace the filter in the forced-air system. Clean debris and vegetation from the exterior condenser or heat pump. Check dehumidifier and clean if necessary (if applicable). Have well water tested for quality (if applicable). It is recommended that you test for bacteria every six months. 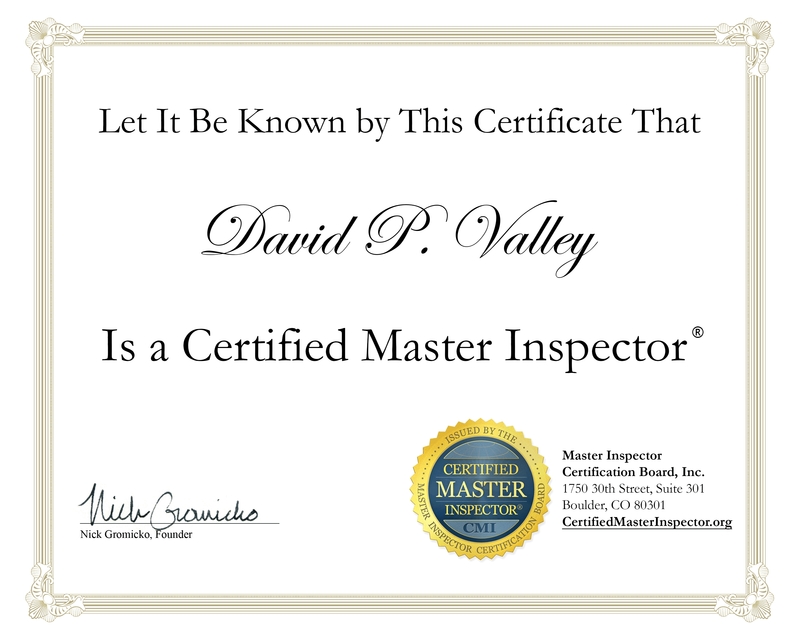 If you are on a Septic system, have it pumped and inspected. Clean windows, screens and hardware, and replace storm windows with screens, if equipped with single pane windows. Check the windows for cracked or broken glass, loose putty around the glass panes, holes or bent frames in screens, and evidence of moisture between pane and storm windows. Clean out any slider door tracks and ensure that the drainage holes are clear. Fix squeaks in floors and stairs by applying weight to the area (having a partner stand on it) and driving an 8d or 12d galvanized finish nail through the flooring into a floor joist or stringer. If you have access to the floor from underneath, glue and screw backs to the floor or treads and toenail through a floor joist or stringer. Check to make sure your sump pump works properly by pouring water into the pump silo to raise the float and activate the motor. Ensure discharge pipe is connected and allows water to drain away from the foundation and inspect the hose line for obstructions or visible leaks. Re-level or repair any exterior steps or decks which moved or were damaged due to winter frost or settling. Check for damaged or improperly sloped gutters. Clean out all gutters and downspouts. Make sure they are free from leaks and rust and ensure all spikes, straps and clips are tightly fastened. Seal any loose joints and seams. Make sure downspouts are not damaged and carry all roof water at least five feet away from the foundation. Downspout extensions will improve any basement seepage conditions. Inspect window putty on the outside of glass (single panes) and replace if cracking or falling off. Lubricate all door hinges and tighten screws as needed. Lubricate squeaky door hinges with lightweight machine oil. Free sticky doors by trimming edges or shimming hinges with thin pieces of cardboard. Deep clean all carpets and rugs. Check caulking around all sinks, bathtubs, and showers. Some types of caulking become brittle with age, and therefore useless as a water seal. Replace with a long-lasting resilient caulking material, such as silicone or latex. Inspect the crawl space or basement walls after rains for water accumulation or excessive moisture. Look for signs of water damage on the sub floor and joists beneath bathrooms, the kitchen and laundry. Find and fix leaks now or pay the price later. Check basement pipes for condensation or dripping, and take corrective action, for example, reduce humidity and or fully insulate all accessible cold water pipes. Probe visible wood structural members such as sills, joists, beams, and columns, with a screwdriver, pocket knife or ice pick, to be sure wood is solid and free from decay and wood boring insects. If you have a plumbing fixture that is not used frequently, for example, a laundry tub or spare bathroom sink, tub or shower stall, run some water briefly to keep water in the trap. This prevents sewer gases from entering the living area. You can use cooking oil to replace water, as it will not evaporate like water will. Check the basement floor drain to ensure the trap contains water. Refill with water or oil if necessary. Check security of all guardrails and handrails throughout house (interior and exterior). Install bracketry or hardware if loose. Lubricate garage door hardware and ensure that it is operating properly and lubricate the automatic garage door opener motor, chain, etc. and ensure that the auto-reverse mechanism is properly adjusted. Make sure all bolts and screws are properly tightened and secured. I highly recommend that every homeowner install an auto-closer on the hinges of the fire rated door between the garage and the house. 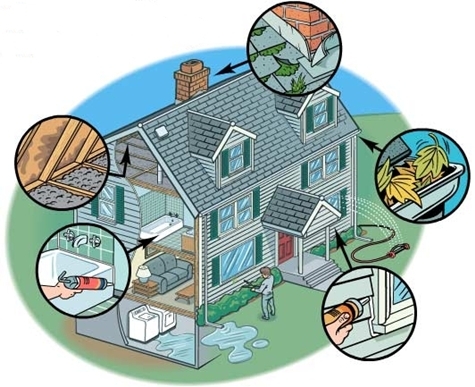 Check and replace damaged caulking and weatherstripping around all exterior windows and doors. Inspect electrical service lines for secure attachment where they enter your house, and make sure there is no water leakage into the house along the electrical conduit. Check the seal at the house penetration area. Ensure that the ground around your home slopes away from the foundation wall, so that rain water does not drain towards your basement walls. Soil should slope four to six inches for a distance of six feet out from the foundation walls. Inspect masonry foundation walls (inside and out) for cracks or weakened, crumbling mortar. Repair if necessary. Also check for signs of termite mud tunnels. Check exterior wood siding and trim for signs of deterioration such as peeling or cracked paint. Remove any wood/soil contact to prevent rot and wood boring insects. Clean, replace or refinish as needed. If you decide to repaint your house yourself, you can cut this job down to size by painting just one or two walls per year. Typically, the paint on the south and west-facing walls deteriorates faster and requires more frequent re-coating than paint on north or east-facing walls. Check for and seal off any holes in exterior cladding that could be an entry point for small pests such as bats, mice, squirrels and chipmunks. Clean and seal decks. Ideally, you'll need three consecutive warm, sunny days. On day one, dry out the deck. Apply deck cleaner and scrub the deck on the second day and let it dry 24 hours. On the third day, apply deck sealer. Repair and paint all fences as necessary. Remove or trim any plants, shrubs or vines that contact any house siding. Climb up on your roof or use binoculars, to check its general condition and note any sagging that could indicate structural problems requiring further investigation from inside the attic. Note the condition of roofing material for possible repair or replacement, and examine all roof flashing's such as at the chimney, roof joints, vent stacks, dormers and skylights for any signs of cracking or leakage. Check the chimney cap and the mortar between all bricks. Tuck point between the bricks if necessary. If you have access to attic spaces, check underneath the roof for stains that indicate leaks, especially from "flashed" areas. Tar these exterior flashing areas if necessary. Also, check all soffit vents to make sure insulation is pulled away from these areas. The attic area should always be the same temperature as the outside. And last but not least, In the event of fire, flood or other disaster, it will be important in filing an insurance claim. Photographs or video of your possessions can also be helpful. Store this in a safe place off site...maybe a relatives home. This is a fantastic online interactive home maintenance guide where all registered users (Homeowners) will sign up for free automatic home maintenance reminders. Homeowners can sign up any feature of their home, and will receive email reminders according to their personal profile or when it is time to do the recommended maintenance for each of these unique features of their home. You will also have the option of receiving Season appropriate email reminders describing specific maintenance steps that you should be taking in order to keep your home in top-notch condition. You simply choose the components of your home that need maintenance and a Seasonal email reminder will be sent to you accordingly. You can review all of your current monthly scheduled maintenance items. And if you get really excited about maintenance and want to see future maintenance activities, you can select the desired month and it will show you all upcoming tasks.